Get this handy kitchen measuring tools comparison chart that you can laminate for all your baking and cooking needs. You won’t need to get out your calculator or guess with this chart. You can print this kitchen comparison measuring chart and laminate it, to keep handy and learn the different volumes and equivalents. Sometimes it is difficult to know the difference between volume and ounces, but this chart gives you all the options. When measuring dry ingredients, it is always best to have a kitchen scale like the one I use. It is much more accurate. Liquid volumes need to be done in a measuring cup like this one. Recipes can be ruined if you don’t use the right amount of liquid or dry ingredients. You can’t eyeball or estimate what 1/4 cup is if you only have a Tablespoon. Think of it as getting a math lesson and having it right on your refrigerator or in your favorite cookbook. Make sure you visit some of my other tips in the kitchen. Also, follow me on Twitter and Instagram for more interaction. Thank you for visiting my blog and leave me a comment letting me know if this chart was helpful. 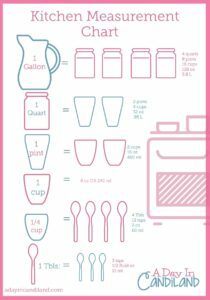 Get this Awesome Kitchen Measuring Tool comparison Chart when you subscribe to get our weekly recipes and encouraging tips. Awesome! Way to go. You should receive your FREE Kitchen Tools Comparison Chart soon. You will also receive recipes and encouraging tips each week. This is a great chart! I have trouble explaining equivalents when my boys help me in the kitchen ! Thanks Paula, I like how it came out. I never seem to have the right size cup or spoon so this will be really helpful! I could have used this the other day when converting a drink recipe to make enough for my neighbor's party! Thanks for stopping by Heather, I hope it was a great party. I'm always looking for something like this–very handy! I like it for my kids, I say it helps them with math. Yes, it probably will help him. I like to let me kids see it and learn from it. What a helpful kitchen tool. Pinned! I cannot tell you how many times my husband and I have asked these questions while cooking! Love the FREE printable! I thought the same thing with my kids. This is great Candi. I have a bridal shower to go to, and I am going to attach it to the gift. Great Idea Jen. I might suggest that on my social media. I love to bake but with a big family I am always doubling and tripling recipes so this will come in handy! I know the feeling. We have 5 and it is just a little more than a normal recipe with 3 boys. This is fantastic! I printed it and taped it inside my baking supplies cabinet for easy reference. Thank you! Thanks Jill, That will make it easy for everyone. Love your printable Candi! So cute and better yet so useful! I love useful . I even have to check measurements now and then! Thank you! I so love this easy conversion chart! Pinned it for use with my kids. This is great! I totally love the visual aspect to this. This is a great chart. I pinned, printed it and will stick it up in my Kitchen. Thank you so much.